This is a review of MavenLabs BrainStack. 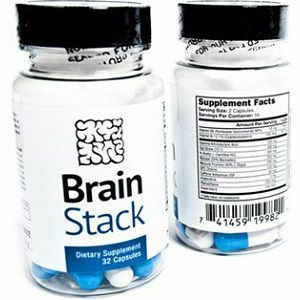 This product claims to increase focus, motivation, efficiency, memory, cognitive function, mental alertness, and productivity. It also supports your learning and retention ability. Learn more about BrainStack as you read further. Alpha GPC– enhances attention, focus, cognitive ability, and memory. Huperzine A– improves cognitive function, memory, and behavior. Hericium Erinaceus- promotes memory, focus, and nerve repair. It also regulates cholesterol and blood sugar levels. L-Theanine- improves the immune system, sleep, mood, cognition, and focus. It also reduces stress. Caffeine- enhances memory, focus, and stamina. It also reduces depression and detoxes the liver. Bacopa– acts as a concentration and memory enhancer. Pterostilbene- fights off cognitive decline and lowers cholesterol and blood lipid levels. Mucuna Pruriens- boosts focus, energy, and concentration. It also promotes deep sleep. GABA- promotes calmness and decreases anxiety. Vitamin B6- regulates mood, increases energy, and supports brain development. Vitamin B12- combats stress, fatigue, and lethargy. It prevents mental decline, improves mental clarity, and enhances focus. Acetyl-L-Carnitine HCL- decreases fatigue and improves energy production. Users are advised to take one capsule in the morning and increase the dosage to around 3 to 4 capsules depending on an individual’s needs throughout the day. The manufacturer warns against consuming more than eight capsules within 24 hours. It is also advisable to take BrainStack with food. The manufacturer claims that BrainStack does not have long-term side effects because most of the ingredients have been reported to be safe. One bottle containing 32 capsules (two-week supply) will cost you $34.95 per bottle on the official website. A monthly subscription package of two bottles will cost you $27.50 per bottle on the manufacturer’s website. A monthly dosage (two bottles) with no subscription will cost you $32.50 per bottle. All prices are lower than the retail prices. This price is fair considering the cost of related products in the markets. You can also benefit from free shipping for purchases of at least two bottles. Discounts are also available for products bought in bulk. The manufacturer provides a sixty-day productivity guarantee. Dissatisfied users can return the product and receive the total purchase price. This guarantee implies that the manufacturer is sure that you will be satisfied with the performance of the product. We also found many customer reviews on the official website. Most consumers have expressed their satisfaction with the product, which is a clear sign of quality and effectiveness. BrainStack is an ideal supplement because of its blend of trusted ingredients. Furthermore, users have reported enhanced focus, memory, productivity, and cognition. A productivity guarantee encourages potential users to purchase the product. Furthermore, the manufacturer offers the product at a price that cannot cause potential buyers to question the quality of the product. Users can also take advantage of discounts. However, shipping is only available in the US. Moreover, there is no information about GMP certification. Users may also have trouble in the attempt to find the appropriate dosage for their needs. Henry Costa	reviewed MavenLabs BrainStack	on June 29th	 and gave it a rating of 4.